Going into the arrival of the 7 of 10 scenarios predicted to occur before the end of 2010, all looks calm! At least this was the case on December 20, 2010. In fact, half way through December 20, 2010, UTC time, the live seismographs were dead calm except for a bit of magma sloshing. The IRIS chart showed no new quakes over magnitude 4.0. On this IRIS chart, below, all recent quakes are in orange, a day late, not red as same-day quakes are shown. No quakes magnitude 4.0 or greater, had occurred since December 19, a full 13 hour absence. Could this be a cover-up, in anticipation of the arrival of the 7 of 10 scenarios? The live seismograph can be dialed down to be less sensitive, and this has been done several times since the arrival of Planet X in 2003. Certainly quakes can be kept from the databases. The USGS dominates the world scene in this regard, and has been caught deleting quakes and reducing the magnitude of quakes many times since 2003. But could this just be a calm before the storm? Lets compare to a December several years ago, prior to the big 9.5 quake in Sumatra on December 26, 2004. Note that on December 16, 2004, before the dual magnitude 8 quakes in Tasmania on December 23, and before the massive 9.5 quake in Sumatra on December 26 - things were very calm! The quakes are in orange, not red, except for a small quake on the Aleutian Islands which is in red. Yet days later, the big one hit, as shown on the December 29, 2004 IRIS chart. The Zetas likewise indicated that as the tongue starts to slide under the curve of the Indo-Australian Plate, that volcanic activity would be reduced in Sumatra and Java, because the magma could flow along and not be caught in pockets. ZetaTalk Explanation 10/23/2010: Will Krakatoa erupt, giving warning that the bending of the tongue holding Indonesia is about to begin? Surprisingly, the nervous volcanoes in Indonesia will not increase their eruption much beyond where they are today, during the elevation drop. The reason is because the pressure of plate movement is going elsewhere, in a different direction. Volcanoes erupt because magma is pushed into pockets near the surface, without an opportunity to escape into the general flow of magma that takes place under the plates. Rather than compress the tongue holding Indonesia, the dropping of the tongue allows this tongue to expand, to fan out under the curve of the Indo-Australian Plate. At the present time, the pockets under this edge of the tongue are increasingly compressed, thus the increased activity noted in Indonesian volcanoes recently. Krakatoa did erupt, briefly, just after Obama's nervous visit to the region, but settled down promptly after that, as did the violently erupting Merapi volcano which chased Obama out of Jakarta early during his visit. In fact, volcanic activity has calmed down in Indonesia! In Issue 210 of this newsletter, on November 7, 2010 we noted that there were 21 volcanoes on alert, the highest number ever. Yet there are only 5 active volcanoes at present, per RSOE - Semeru, Batu Tara, Ibu, Dukono, and the Barren Islands (just north of Sumatra). Thus, with reduced volcanic activity, per the Zetas there will be no certain predictor to warn mankind that the start of the 7 of 10 scenario in Indonesia, the steady sinking, is about to begin. ZetaTalk Prediction 10/16/2010: There is no predictor indicating that the bend and drop are about to happen that we could point to. There are, as we mentioned there would be, indicators of the direction that the plates are being pushed, as Jakarta has been sinking, Pakistan sinking, and the Coral Sea floor rising. We are telling you your coastlines are not safe, and the rest is up to you! The Christmas Hammer started on December 20, 2010 with massive global shuddering at approximately 18:00 UTC, when the magnetic N Pole of Earth comes up over the horizon to face the approaching Planet X. For several days in a row (December 20, 21, 22, and 23) the hammer struck. Per the Zetas, 18:00 UTC is also when Planet X is positioned overhead, above the point where the Indo-Australia Plate is lifting and being driven under the Himalayas. 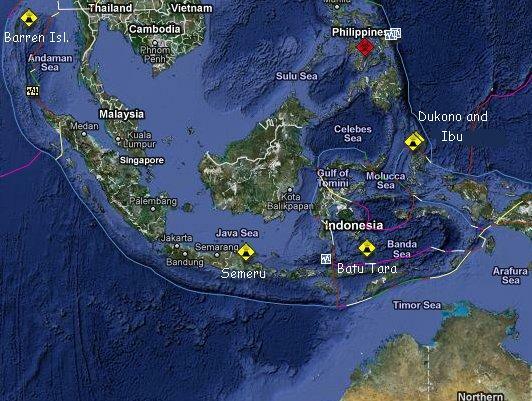 It is thus positioned over Indonesia, where sinking is expected to start the 7 of 10 scenarios. ZetaTalk Explanation 9/11/2010: The twice-a-day shudder - when the Atlantic Rift is facing Planet X at 12 UTC and later at 0 UTC when it is in opposition on the other side of the globe - is still present. 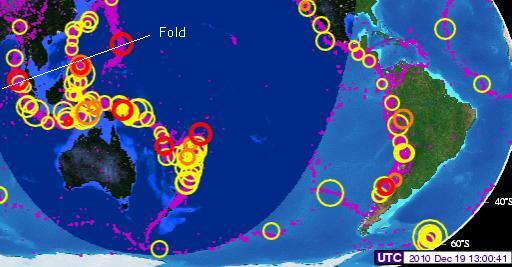 Since the Atlantic Rift runs from Iceland to South Africa, this involves a tug that affects the entire globe. The daily Figure 8 roll caused by the N Pole of Earth being pushed away when it comes over the horizon continues. This occurs when Planet X is facing the central Pacific at 18 UTC and as would be expected hammers at the brake point near the Solomon Islands. At 3 UTC a similar point is reached when the N Pole of Earth is hidden behind the horizon so the globe can bounce back. But in addition to the Atlantic Rift tug and the N Pole push and rebound there is also stress on the globe from Earth glancing off the magnetic field of Planet X. This is not the temporary tug or the back and forth shove but a sudden flip to the side into a temporary lean to the left or opposition. As is known, there is a magnetic anomaly just to the west of South Africa, which acts almost like a second S Pole for Earth and is positioned on the other side of the Earth at the same latitude from the Earth's magnetic S Pole. The N Pole of Planet X grabs this anomaly, as it is a type of S Pole, thus lurching plates nearby. Chile had a quake during this 8 UTC time period. During one of these hammer blows, a significant quake off shore from Japan in the Bonin Arc region occurred. At first called a magnitude 7.9, this was later downgraded, as usual, by the USGS to be a 7.4. The tsunami that followed did not cause the high tides and choppy waves noted throughout Indonesia and in Australia and New Zealand, however, as the tsunami for this Bonin Arc quake progressed northwest. The Bonin Arc is part of what is called the Izu-Bonin-Mariana arc, along the eastern edge of the Philippine Plate as it approaches the point where 3 plates meet at Mt Fiji - the Philippine Plate, the Pacific Plate, and the N American Plate. From the start of the Bonin Island hammering on December 20, 2010 at 17:19 UTC until December 24, 2010 at 10:05 UTC there were 101 quakes above magnitude 4.7 in this hammer. And still ongoing. Mount Fuji is at the point where these three arcs meet. In nervous anticipation of the 7 of 10 scenario in Indonesia predicted to arrive by the end of 2010, the Zetas were asked if the matter would be downplayed by the media, or how it would play out. Their response was to explain that Indonesia would sink in spurts over a 2-3 week period, with the S America roll scenario starting shortly after Indonesia's sinking begins. ZetaTalk Prediction 12/18/2010: The 7 of 10 will unfold but not as expected by many. It will not be a dramatic announcement on the news, as the establishment is ready for this, due to the extensive discussions. As we stated, there would be large quakes when Indonesia sinks but not the major quakes one would expect, not magnitude 8-9. Already there are many periods when quakes line the plate borders, and hammer there. During one such episode, the elevation will start to drop. We have never stated, in our predictions, how fast this would go, just said "suddenly". The start will be sudden, almost without warning, but the progress not swift as in the pole shift hour. It will be a steady sinking, in short bursts, over a 2-3 week period. S America will be right behind Indonesia in this regard, starting its roll. This will start slowly at first, the trend already noted, but the quakes starting to pick up as Indonesia sinks. Thus it will not be before the early part of 2011 before the full impact of the prediction accuracy is noted by the world. Meanwhile, the establishment will try to cover with lots of talk about storm surge, Global Warming, and high tides. A careful check of prior ZetaTalk shows that where they stated the 7 of 10 scenarios would arrive by the end of 2010, they did not specifically state that "shocking the world" would happen by the end of 2010. ZetaTalk Prediction 7/19/2010: We were only allowed to state that one or more of the plate movements described would happen by the end of 2010, when a 7 of 10 would have arrived, and that a 7 of 10 would "shock the world" so that there would be no doubt it had arrived. ZetaTalk Prediction 7/31/2010: Our statement is that a 7 of 10 would "shock the world" and be unmistakable. At least one of them will occur before the end of 2010. ZetaTalk Prediction 8/7/2010: Our prediction that a 7 of 10 will occur by the end of 2010, and will "shock the world". With a 2-3 week span for the sinking of Indonesia, it is anticipated that high tides would at first be blamed, then perhaps a storm surge if there are any storms in the area, with lots of chatter about what Global Warming has done to low lying areas. At some point, of course, a loss of elevation of 80 feet for Java and Sumatra, etc. could not be covered up by the media. Word would get out. But look how long it took for an admission on Pakistan! The flood waters that beset Pakistan in July, 2010 have not receded completely, and there is at last an admission that they are not going to recede. In other words, Pakistan, on the western border of the plate holding India, has sunk, just as the Zetas predicted. ZetaTalk Explanation 4/17/2010: The Indo-Australian Plate will tip sideways so that Indonesia can plunge under the eastern side of the plate. Islands in Indonesia will be affected by this plunge, ultimately sinking. Do such adjustments happen all at once, or gradually? Both occur, but the trend is unmistakable long before a major adjustment occurs. ZetaTalk Prediction 10/16/2010: We have predicted that the western edge of India will only lose 10 feet of elevation during the 7 of 10, and given the degree of flooding that Pakistan is already experiencing, Karachi has already experienced some of this elevation loss. The flooding in Pakistan, however, is afflicting the Indus River valley to the east of Karachi at this time, on that portion of Pakistan lying on the plate holding India. This issue was presented in this newsletter on Issue 201 on September 5, 2010 when the flood waters were slow to recede. And in Issue 212 on November 21, 2010 when they were shown to be lingering even months after the July floods. But now, there can be no denying the situation. Earth Observatory, a NASA function, admits that by comparing images from the year before, Pakistan's elevation has sunk. Period. The Zetas state this drop would be 10 feet, and this 10 foot drop is apparent. Compared to the image acquired a year earlier, however, the December 2010 image shows the extent of the lingering floods. Lasting flood damage is also apparent along the coast, around the city of Thatta. 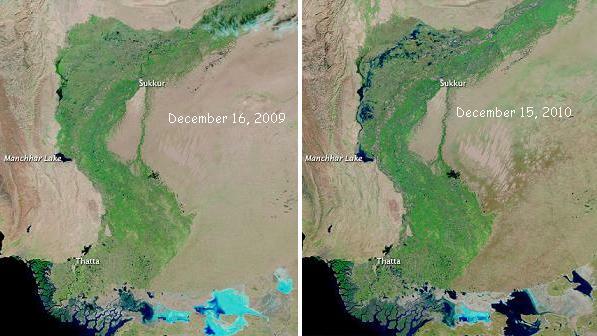 Although the image from December 2010 shows remarkable improvement over conditions two months earlier, it also reveals persistent pockets of floodwater that did not exist the previous year. We are aware that Pakistan has lost elevation, and Thailand at Bangkok likewise cannot get their flood waters to drain, and Jakarta has been sinking, with land and road along their drainage canals collapsing. 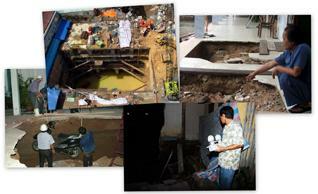 But Vietnam has also been experiencing sinking, as evidenced by an epidemic of sinkholes. HCM City's Union of Science and Technology Association has set up a team to discover the cause of the sinkholes that have appeared in many locations in the city. So far 59 of the sinkholes have appeared after first appearing in July. The depressions were a consequence of the land structure and water in the city. The most important cause was the bogginess of the land in many places in the country's south-east. We presented this anticipated scenario during the 7 of 10 episodes in Issue 199 of this newsletter on August 22, 2010, whereby the Marian Trench folds against the Mariana Islands, and then the Mariana Plate tilts, rising the Mariana Islands slightly. Then the Marian Plate folds against the Philippine Islands, which are on the rising part of the Philippine Plate. Then the Philippine Plate folds against the tongue holding Indonesia. Like a deck of cards, being folded, they are all then pulled down as Indonesia sinks. In Issue 207 of this newsletter on October 17, 2010, this folding of the Pacific is considered the third step in the 7 of 10 scenarios, but as the Zetas have stated, the trend is always apparent before major plate movements occur. On December 19, 2010 a remarkable lineup of quakes from the Mariana Island to the Philippine Islands to the northern coastline of Sumatra occurred, showing the pressure on these plates to fold in just the manner described by the Zetas. Pressure on the Mariana Plate transfers to the Philippine Plate which transfers to the tongue holding Indonesia! There was no anticipation of gale force winds, cyclones, tropical storms, or any such incident in the days before high winds and high tides hit the Indonesia region, including the Philippines. High winds were not predicted for this region. So when high tides and choppy water was reported throughout the Indonesia region, the question naturally arose - could this be the start of sinking? There was, after all, an outline of quake all around the tongue holding Indonesia, when the reports first started coming in on December 20, 2010. Strong Northeasterly winds over 60 kmph with waves up to 5.5 metres occurring over the waters off Condore and Reef North are expected to continue until 22 December 2010. A total of 11 foreign tourists consisting of Singaporean, Malaysian, Indonesian and Australian nationals were rescued by elements of the Philippine Coast Guard after encountering giant waves while having a kayaking and canoeing adventure along Sabtang Island in Basco, Batanes. Hanoi - At least six people were killed and 47 missing after last week's strong winds and rain in the South China Sea off Vietnam. The storm lashed the coast, sinking 26 ships. But New Zealand and eastern Australia also had high winds and high tides, and this region is not expected to sink, but rather to rise. 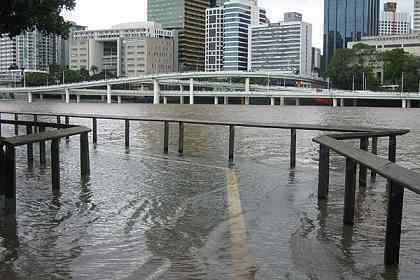 Low-lying areas have been flooded this morning due to an extremely high tide in the already swollen Brisbane River. Strong winds buffeted Wellington, bringing down trees, trolleybus wires and lifting a trampoline. Per the Zetas, it was not sinking land in Indonesia, but a compressing Pacific causing a wash of water over this entire region. The high tides were blamed on the winds during that time, as a cover-up over the Earth changes is in place. ZetaTalk Explanation 12/25/2010: There was clearly a storm, as high winds accompanied the high tides and high waves. But is there more to the story? Nancy has done some research and concluded that there seemed to be no warning for the storm. It did not seem to be documented as a cyclone nor tropical storm, even after it occurred. We stated that sinking in Indonesia would be covered by claims of high tides and storms, and this is an example though scant additional sinking occurred on this day. But more occurred. The Pacific plates, which are, as we explained, not just one but four, compressed, acting as the trigger for the 7.4 quake in Japan. These compressing plates, one plate sliding under another, force an adjustment in the water above, which disburses. Thus Australia at Brisbane experienced a high tide, and lands from the Philippines through Indonesia experienced high waves and choppy water.